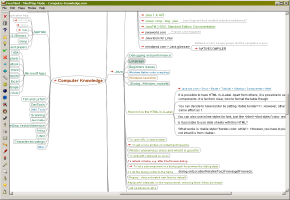 FreeMind is a premier mind-mapping software written in Java. I think that there's a solid niche for free, simple Mind-Mapping software. I almost gave it a "3" but there's not a lot of half-decent free Mindmapping software around. Not everybody needs fancy features. However, it's been my experience that anybody committed to learning and using Mindmapping in general is willing to pay a bit for good software. Mindmapping will continue to catch on and many students will use it at a basic level for brainstorming, essay outlining etc. Speaking as someone who has read several books and done many maps, I highly recommend starting with the definitive Tony Buzan book, some markers and a large sketch pad. You can likely Google for some good info, but the Tony Buzan Mindmapping book is the very best way to get into this. The book (which includes amazing study time management techniques) was incredible and helped me achieve the highest recorded mark in the history of my school in Electronics. Again, all I needed was they Tony Buzan book; what helped for mys school work (and personal life) was time managment and creating simple Mind Maps for outlining courses. Although in Beta this program has won my mind! Works great and simple to use and above all its free. Also expansion to concept mapping capabilities would be great, but alas, it is a mind mapping software. The best free option available, imho, but not perfect. For pay options like Inspiration have gone much further along the path and it shows (freemind developers could learn a trick or two from them). Nowhere as good as MindManager, but still decent. If you can afford MindManager, get it. If you can't afford it, then get this program. Very poor imitation of mind manager. It will not export notes as does mind manager. It will not export to RTF/Word format as will mindmanger. this program definitely competes with MindManger and deserves a higher rating for its price and functionality. A must for everyone who doesn't want to pay extra for some extra features. helps sort out thoughts and ideas. Surprised nobody has written a review on this. If you don't know, this "mind-mapping" software is basically a way to organize ideas visually in a tree-like structure. It's good for brainstorming, note taking, and also good for presentation. Freemind uses Java -- which is good because it is cross-platform, but unfortunately hurts performance a little bit. It competes with the commercial MindManager X5 -- which provides MS Office-like on-the-fly spell checking and a useful "presentation mode". If you write a lot of essays, or take a lot of notes, I suggest you try it. It's free anyway.